I'm going to try out this occasional feature where I can deal psychologically with the at times frustrating and other times bizarre "reality" of living in Southern California. Hopefully there will be some humor mixed in to lighten the mood as this dysfunctional region attempts to correct years of bad planning and a car-first mentality in order to transition to the new green, sustainable economy. So Los Angeles is finally getting serious about a bus lane along Wilshire Boulevard by 2013. Great. But what about repaving this pock-marked piece of pavement NOW? There are roads in Baghdad and Kabul that are smoother than Wilshire Boulevard. It is a disgrace and a shameful display of the years of neglect this city has put towards its roads. Wilshire Boulevard historically has the been the main boulevard of the City of Angels. It cuts a swath from the Pacific Ocean through the heart of Los Angeles and into downtown, passing Santa Monica, Brentwood, Westwood, Beverly Hills, Miracle Mile and Koreatown along the way. But if you have ever taken a bus ride on the 20 or 720 on the far right lane of Wilshire get ready for a bumpy ride. You will fly off your seat more times than a Six Flags roller coaster or a rural road in Ecuador. 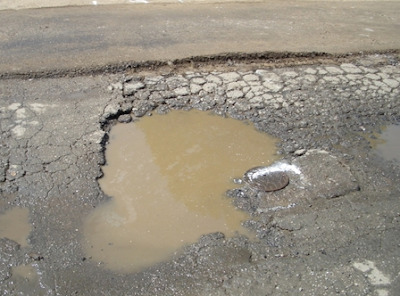 And these aren't even potholes I'm talking about, these are craters bigger than the moon. Ironically the absolute worst stretch of pavement along Wilshire is the ritziest -- all those garish looking condos in Westwood built by Don Sterling's dirty money and inhabited by batty celebrities who drive their luxury cars on the left side of the road (the smoother side). But for those Angelenos such as myself who actually choose to ride the bus (I have a car but don't use it), we have to suffer on the road from hell in the City of Angels. So Mayor Villaraigosa, if you are really serious about cleaning up L.A. and changing its image, the most important and immediate thing you can do is to repave Wilshire Boulevard so it can be a grand thoroughfare again instead of a sorry stretch of concrete befitting a third-world country. I didn't bring my camera to the UCLA campus for the LA Times Festival of Books this past Saturday so this above picture will have to stand in for the anti-Cap and Trade guy at the event. Now I'm used to the Jews for Jesus people every year at this event pretending they aren't just Christians. 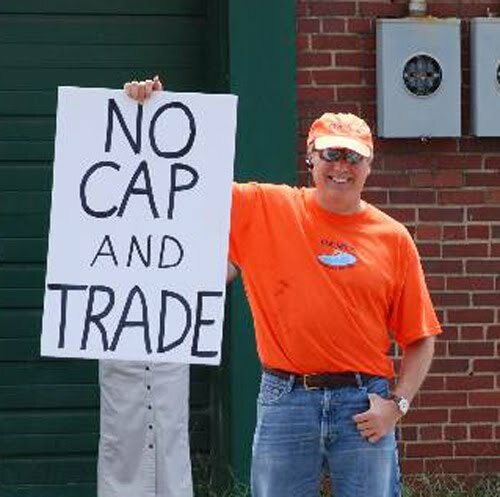 But a guy with a sign that says "Stop Cap and Trade Assembly Bill 32. It's a job killer." Well, now that is a whole new level of contradiction. For those who don't know, AB 32: Global Warming Solutions Act was passed and signed into law in 2006 and mandates a reduction in greenhouse gas emissions by 2020. These reduction measures are set to start in 2011. The scoping plan measures implementation timeline describes each sector and regulation and can be found by clicking here. "In March 2010, almost four years after its passage, the California Air Resources Board ("CARB") issued a report claiming that the law would create about 10,000 new jobs for California in the next ten years." Click here for a link to a story on the positive job growth from AB 32 in the Sacramento Business Journal. Anyway. I told the anti-cap and trade guy I'd include him in my green blog so I hope he likes it.